KICKSTART your life with a visit to your local TAFE. January 15-20 is Enrolment Week for TAFE NSW locations where future students will get the chance to find out all there is to know about their dream studies. “TAFE NSW is more important than ever because of the high quality VET training it is known for delivering,” said Marie Larkings, Regional General Manager, TAFE NSW. 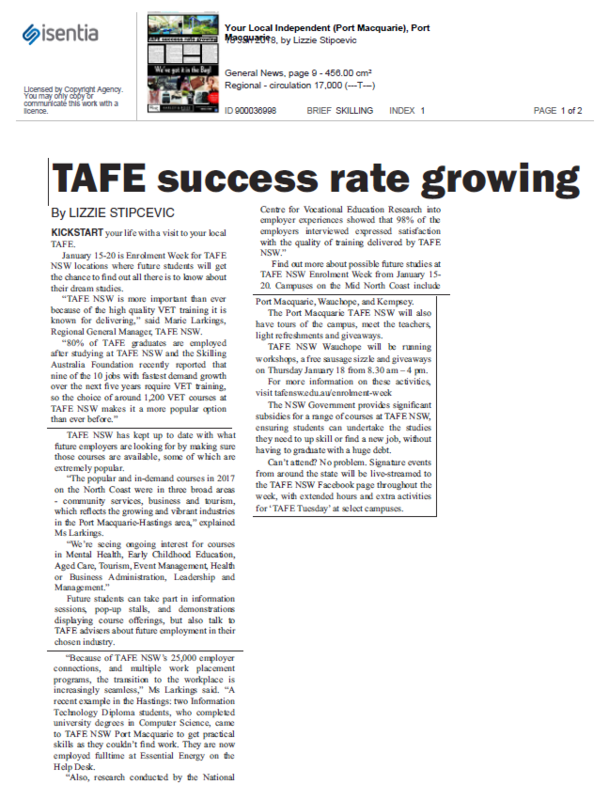 “80% of TAFE graduates are employed after studying at TAFE NSW and the Skilling Australia Foundation recently reported that nine of the 10 jobs with fastest demand growth over the next five years require VET training, so the choice of around 1,200 VET courses at TAFE NSW makes it a more popular option than ever before.” TAFE NSW has kept up to date with what future employers are looking for by making sure those courses are available, some of which are extremely popular. 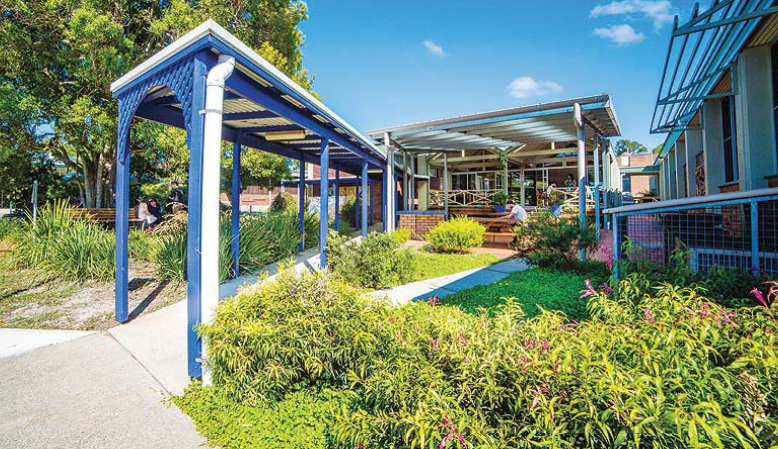 “The popular and in-demand courses in 2017 on the North Coast were in three broad areas – community services, business and tourism, which reflects the growing and vibrant industries in the Port Macquarie-Hastings area,” explained Ms Larkings. “We’re seeing ongoing interest for courses in Mental Health, Early Childhood Education, Aged Care, Tourism, Event Management, Health or Business Administration, Leadership and Management.” Future students can take part in information sessions, pop-up stalls, and demonstrations displaying course offerings, but also talk to TAFE advisers about future employment in their chosen industry. “Because of TAFE NSW’s 25,000 employer connections, and multiple work placement programs, the transition to the workplace is increasingly seamless,” Ms Larkings said. “A recent example in the Hastings: two Information Technology Diploma students, who completed university degrees in Computer Science, came to TAFE NSW Port Macquarie to get practical skills as they couldn’t find work. They are now employed fulltime at Essential Energy on the Help Desk. “Also, research conducted by the National Centre for Vocational Education Research into employer experiences showed that 98% of the employers interviewed expressed satisfaction with the quality of training delivered by TAFE NSW.” Find out more about possible future studies at TAFE NSW Enrolment Week from January 1520. 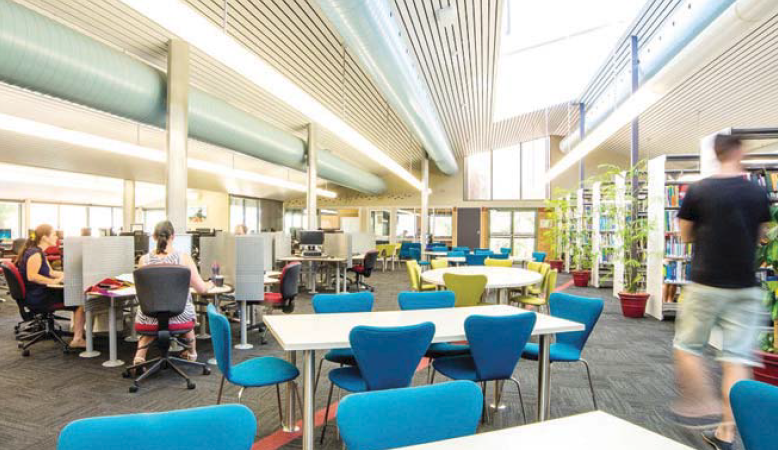 Campuses on the Mid North Coast include Port Macquarie, Wauchope, and Kempsey. The Port Macquarie TAFE NSW will also have tours of the campus, meet the teachers, light refreshments and giveaways. TAFE NSW Wauchope will be running workshops, a free sausage sizzle and giveaways on Thursday January 18 from 8.30 am – 4 pm. For more information on these activities, visit tafensw.edu.au/enrolment-week The NSW Government provides significant subsidies for a range of courses at TAFE NSW, ensuring students can undertake the studies they need to up skill or find a new job, without having to graduate with a huge debt. Can’t attend? No problem. Signature events from around the state will be live-streamed to the TAFE NSW Facebook page throughout the week, with extended hours and extra activities for ‘TAFE Tuesday’ at select campuses.